Listen to or read a single version by itself of Ross Gelbspan’s various narratives about what led him to look into the ‘corruption’ of skeptic climate scientists, and it sounds quite compelling. Know some background information on what he’s talking about, and you wonder why he can’t keep his stories straight. 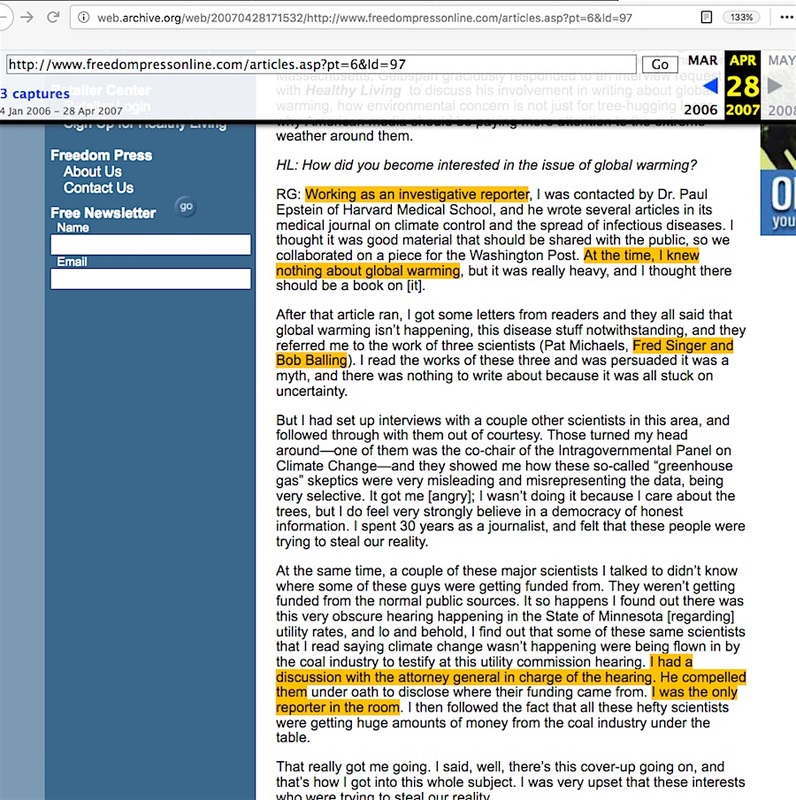 Working as an investigative reporter, I was contacted by Dr. Paul Epstein of Harvard Medical School, and he wrote several articles in its medical journal on climate control and the spread of infectious diseases. I thought it was good material that should be shared with the public, so we collaborated on a piece for the Washington Post. At the time, I knew nothing about global warming, but it was really heavy, and I thought there should be a book on [it]. 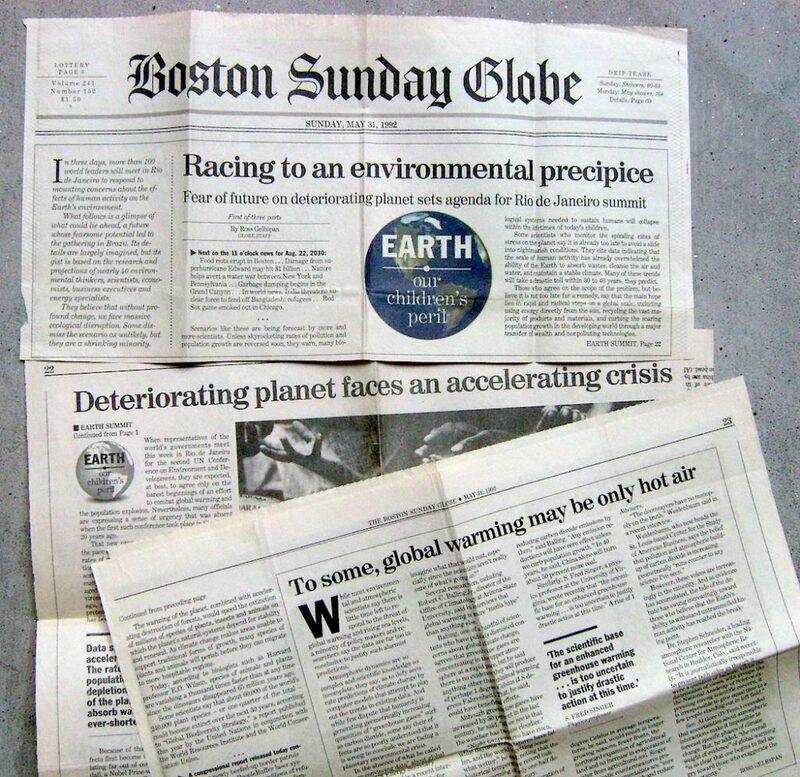 After that article ran, I got some letters from readers and they all said that global warming isn’t happening, this disease stuff notwithstanding, and they referred me to the work of three scientists (Pat Michaels, Fred Singer and Bob Balling). I read the works of these three and was persuaded it was a myth, and there was nothing to write about because it was all stuck on uncertainty. But I had set up interviews with a couple other scientists in this area, and followed through with them out of courtesy. Those turned my head around—one of them was the co-chair of the Intragovernmental Panel on Climate Change—and they showed me how these so-called “greenhouse gas” skeptics were very misleading and misrepresenting the data, being very selective. It got me [angry]; I wasn’t doing it because I care about the trees, but I do feel very strongly believe in a democracy of honest information. I spent 30 years as a journalist, and felt that these people were trying to steal our reality. At the same time, a couple of these major scientists I talked to didn’t know where some of these guys were getting funded from. They weren’t getting funded from the normal public sources. It so happens I found out there was this very obscure hearing happening in the State of Minnesota [regarding] utility rates, and lo and behold, I find out that some of these same scientists that I read saying climate change wasn’t happening were being flown in by the coal industry to testify at this utility commission hearing. I had a discussion with the attorney general in charge of the hearing. He compelled them under oath to disclose where their funding came from. I was the only reporter in the room. I then followed the fact that all these hefty scientists were getting huge amounts of money from the coal industry under the table. By Gelbspan’s own admission, he ‘retired from daily journalism in 1992’, and there is no public record of him being employed as a reporter, freelance or otherwise, after that time. How does it follow that he could justify the assertion that he was ‘working as an investigative reporter’ in March of 1995 when Dr Epstein approached him? 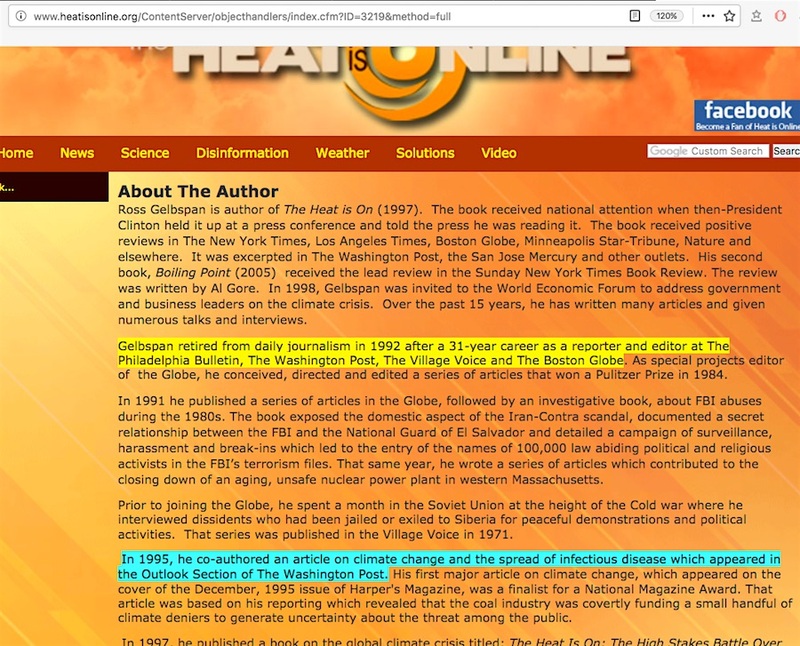 Since he specifically says of the time period when he co-authored the article with Dr Epstein that he ‘knew nothing about global warming’, why would Dr Epstein have chosen him to co-write an article about infectious disease being spread by global warming? 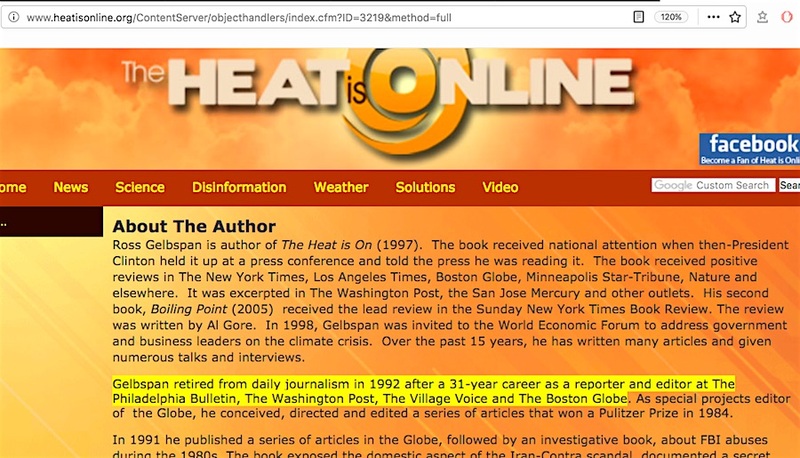 If he knew nothing about global warming, does it follow that Gelbspan – a non-scientist – would have been only ‘investigating’ the spread of disease? 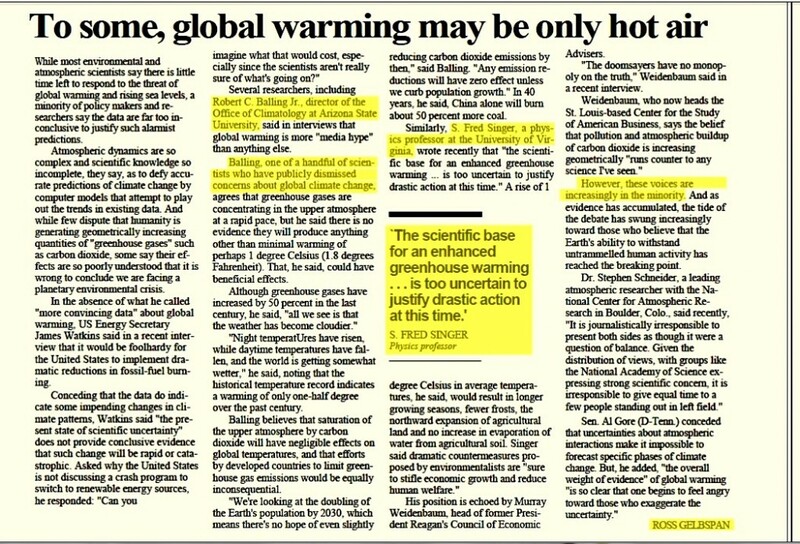 How does it follow that Gelbspan knew nothing about global warming and was seemingly surprised to learn of the existence of skeptic climate scientists, particularly Drs Singer and Balling, when the last article he wrote for the Boston Globe described cataclysmic possibilities of global warming no later than its main 3rd paragraph, while having a sidebar piece within it specifically mentioning Drs Singer and Balling? 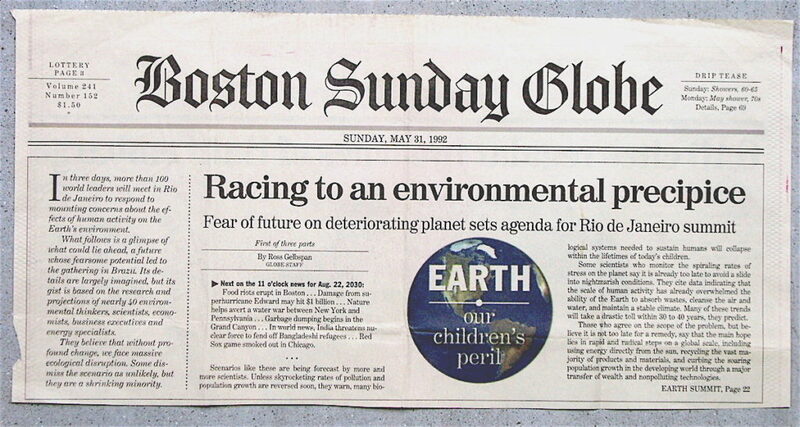 Why would Gelbspan have been persuaded by Singer and Balling in 1995 that global warming ‘was a myth’, when his 1992 Boston Globe sidebar piece clearly labeled both as ‘increasingly in the minority’, and heavily criticized by the late Dr Stephen Schneider and then-Senator Al Gore as ‘out in left field’ and as scientists who ‘exaggerate the uncertainty’? When Gelbspan claims he was ‘the only reporter in the room’, how would he know that if he had been ‘retired from daily journalism’ since 1992, and likely unfamiliar with people there who might have been reporters at the 1995 hearing? How does Gelbspan explain his statement about his discussion with a male attorney general in charge of the Minnesota hearing when he clearly identifies the individual as a female in his otherwise identical description of the situation in a 2011 video appearance? How likely is it that an attorney general of either gender would give any consideration to a private citizen’s suggestion of what to ask scientists testifying at a public legal hearing concerning climate science assessments? But such questions are not the only problems besetting Gelbspan, they’re just more gasoline thrown onto a fire which is already fueled by his narrative derailment concerning the ‘letter-writer backlash’ within this same situation (which I detailed in my August 16, 2013 blog post), among a litany of other problems, including his fundamental long-term failure to produce any physical evidence proving that a quid pro quo arrangement exists between skeptic climate scientists and industry officials for the fabrication of false climate assessments. 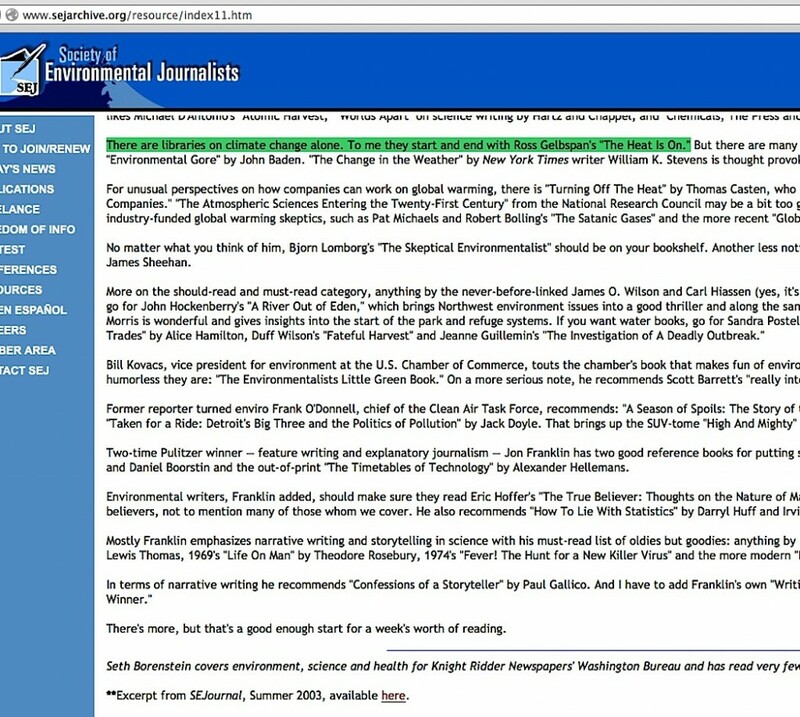 For people like Borenstein, the one last thing to ask in this whole exercise is what the breaking point must be for him and other mainstream media reporters regarding their faith in Gelbspan’s ability to defend his basic accusation against skeptic climate scientists and all his narratives surrounding it. This entry was posted in Discovery odyssey, Narrative derailment and tagged Minnesota Public Utilities Commission hearings, Paul R. Epstein by Russell Cook. Bookmark the permalink.